January 1, 2017, another New Year upon us and another opportunity for some memorable New Years Hikes. Following the trend of the past few years, I set out for some “new to me” falls. There is no better place to look for new falls than on the “Carolina Mountain Club’s Waterfall Challenge 100” list that I am getting into the latter stages of. I set out to find waterfall #78 of the 100, and Cove Creek Falls became the destination of#78. Most of the ones left on the list for me to explore are in this area or the Great Smokies. Finding it only required a little research into the 2 best resources for North Carolina Waterfalls….1)North Carolina Waterfalls Third Edition by Kevin Adams, and 2)www.northcarolinawaterfalls.com website by Rich Stevenson. If one is unable find the information for the waterfall they seeketh on one of these two resources, chances are the waterfall is either on private property, or doesn’t exist. 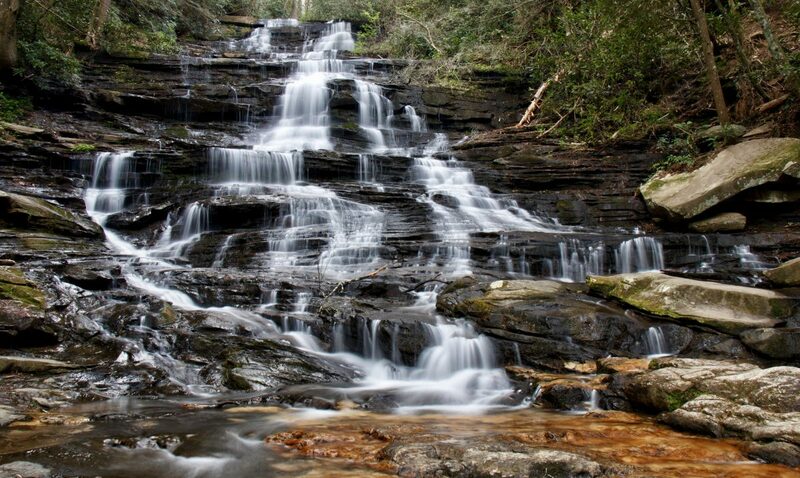 To find Cove Creek Falls, start in Brevard, NC. From the intersection of US 276, US 64, and NC 280, follow US 276 north as it heads quickly into the Pisgah National Forest with the Davidson River flowing on the left side of the highway. Drive 5.3 miles to Fish Hatchery Rd, also known as FR 475. Turn left here. US 276 bears right here and passes Looking Glass Falls just ahead. If the number of cars is minimal, it is a great place to stop at a magnificent waterfall. The problem is, that it is usually jammed packed. Back to FR 475, drive for 1.6 miles, first passing the Looking Glass Rock Trailhead on the right, then the Pisgah Center for Wildlife on the left. Once the paved road turns gravel, pull off to the parking area on the left just before the road crosses Cove Creek. The trailhead is actually a gravel road at first, that leads to the Cove Creek Group Camp. Follow the road until it meets up with Cove Creek. There are some magnificent Cascades along the creek here the I will cover on the way back. Once at the creek, is a ford for vehicles to cross through the creek. There is no way to cross it on foot dryly. However, if you go back just a short ways, is a trail that leads into woods to a bridge for the walkers. Once across, the group camp will be visible soon. Just before the group camp, on the left will be a trailhead for 2 trails. One is a blue blazed trail for the Caney Bottom Trail, and an orange blazed trail for Cove Creek. The trail will turn right soon, then gradually ascend above the camp and creek. A junction will come soon where the Cove Creek trail keeps heading straight and continue ascending, while the Caney Bottom Trail will turn right and descend. I continued on the Cove Creek Trail. Once the trails separate, and you climb a little further up, Cove Creek Falls can be seen well ahead over the drainage to the right, at least in the winter with no leaves on the trees. The trail circles around and once close to the falls a marked side trail leads right and down. The trail led me down to the top of the falls. This is somewhat surprising as there is no real view here. Its also never safe to be at the top. A trail turned left and descended a pretty steep trail to the bottom of the 50 foot waterfall. It was wide open down here and there is plenty of room for photos or a quick dip in warmer weather. This hike was about 2 miles round trip and with the exception of the steep climb down the waterfall, was pretty easy. The next time I go back, when I arrive at the point where the Cove Creek and Caney Bottom trails split, I will take a right and follow the Caney Bottom Trail to Cove Creek and then follow the easy trail upstream to the base.